An annoying ad starts playing in an open tab within the browser. And how to make it stop? Last year Google's Chrome browser started to show a speaker icon on the tab that was making noise. In the latest version of Chrome, 46, Chrome now lets you mute each tab individually. Just right mouse-click on the tab that contains the annoying auto-playing audio or video ad and select the "Mute tab" option. That's it. No more noise. Chrome is a great browser. 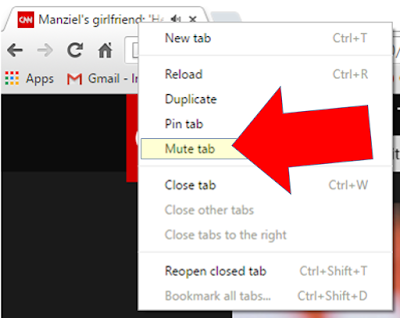 Did you know you can reopen closed tabs in Chrome? Check out our other cool Chrome tips below.